Among hundreds of native bird species, the Mali Firefinch is the country's avian mascot. The firefinch is endemic to Mali, as well as the national mascot. Mali has some of the unique birds regarding habitats and behaviors. The country has different ecosystems such as the Saharan desert, the Sahel region, the savannah, and wetlands, which provide a home to more than 600 species of birds with some non-migratory natives. Though some of these birds have been listed as least concern, the rate of habitat degradation and fragmentation coupled with climate change and desertification has placed a direct threat to the bird population of Mali. The Mali firefinch is an estrildid finch native to Mali and Senegal. The Finch has primarily red undersides and gray wings and a brownish-grey crown. The habitats of the Finch are mainly rocky hillsides, grassy and bushy areas as well as areas with acacia. Foraging is done singly or in small flocks searching for small grass seeds. The non-migratory bird breeds mainly between July and December. Though the bird is not very common, there are no apparent threats to its populations. The desert sparrow is a small bird with a gray upper body, faint sandy underside and long legs. The desert sparrow is adapted to its habitats of arid sandy areas with scattered bushes and trees in the Sahara region. Breeding occurs in two broods from May to August. Breeding can occur solitarily or in colonies. The diet of the desert sparrow is mainly seeds of desert vegetation, ground vegetation, and insects. The species has been classified as least concern though habitat degradation is a significant threat that is causing a decline in their populations. The African gray woodpecker is classified as a least concern bird native to western and central Africa in the sub-Saharan and equatorial regions including Angola, Benin, Eritrea, Equatorial Guinea, Mali, Kenya, and Libya among others. The bird possesses a long tongue for capturing insects such as termites, beetle larvae, and crabs. The upperparts are green while the head and underparts are pale gray. Males have a red crown which is absent in females. The woodpecker is mainly found in woodlands and savannahs. The African Pitta is a least concern afro-tropical bird. The habitats of the bird include deciduous lowland riparian forests, bushy and woodland areas as well as areas of undisturbed vegetation. The African pitta forages singly by scratching on leaf litter for insects and mollusks. The species is threatened by habitat degradation and fragmentation. 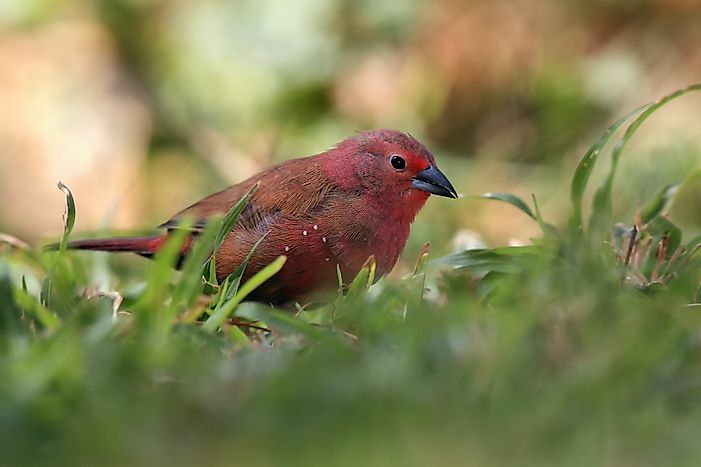 Mali has designated 17 Important Bird Areas which are responsible for protecting bird species such as the Mali firefinch, the only bird endemic to Mali. These protected areas have about 622 birds out of which 335 are a resident. Other Malian birds include fulvous chatterer, Meyer’s Parrot, Lesser Jacana, brubru, African Finfoot and the ostrich.